The earth is huge. If you are standing on low altitudes and look out over water it looks flat. But if you know how perspective works you can see curvature with the help of a zoom camera or telescope. 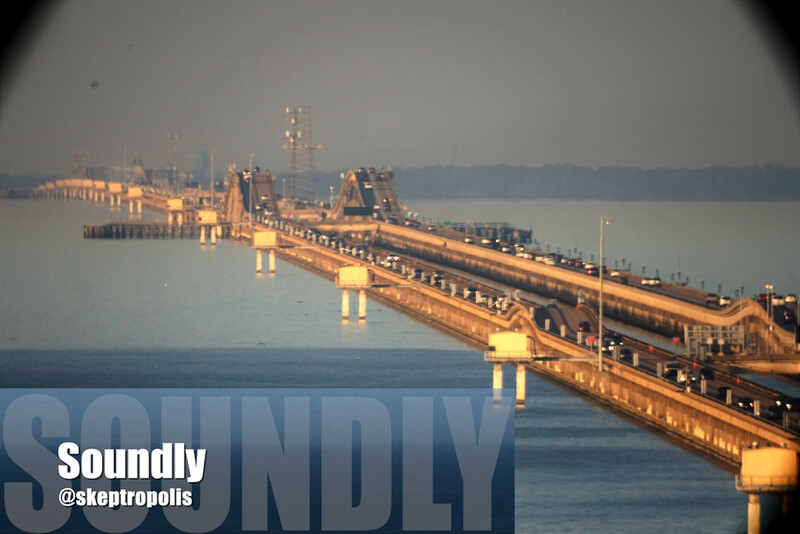 The trick is to look along a very long straight object like the Causeway bridge at Lake Pontchartrain and zoom all the way in on the horizon. The resulting image from a Globe Simulation App and from a picture taken by Soundly through a telescope are shown below. See also Comparison of Globe and Flat-Earth Model Predictions with Reality. Note that the bridge is everywhere the same elevation over water, except at the ship passages. So the bridge follows the curvature of the earth perfectly. This curvature over the horizon may look fake to you, because you may not be familiar with this kind of perspevtive. It looks like the earth is a cylinder. The reason why we see such a curvature here is because zoom compresses distances along the viewing direction and streches distances along the horizon. The huts are about 1.13 miles apart, but seem to be only a few meters apart. On the other hand some people may expect to see a similar curved horizon from left to right. But because of the magnification by the zoom lense you can only see less than a mile of the horizon, so you must not expect to see curvature from side to side. Note that the approximation of Drop = Distance2 × 8", where the Distance is measured in miles and the Drop in inches, is not violated. The huts are about 1.13 miles apart, so the drop from hut to hut is about 10" = 25 cm, which matches what we see on the images. Because of the increasing compression in viewing direction with increasing distance, the horizontal distance between the huts decreases, which makes the arc of the bridge more and more pronounced at the horizon. This is due to Perspective on a Globe. We have to keep in mind that we only see a small part of the earth from low altitudes. At 10 m altitude the horizon is a circle with center at the observer and a radius of only 7 miles = 11.3 km. That is nothing compared with the radius of the earth. Even at 10 km altitude we can only see 357 km of the earth and the horizon looks almost perfectly flat, because the horizon line is a circle around us as seen from a vertical position above its center. Overview: The small sphere on the top right displays the Globe from above the camera. The small square represents the camera, looking in the direction of the top of the page. The blue cicle shows the horizon line as seen from the camera at the choosen altitude. The green rectangle/line shows the range that is dispayed on the Perspective View. Perspective View: The Perspective View below the small sphere shows the view as seen from the cameras perspective. The camera is always pointing at the horizon. Note: the thin grid lines lay always behind the horizon. From high altitudes the globe grid lines are almost perfect ellipses as we expect from everyday experience. 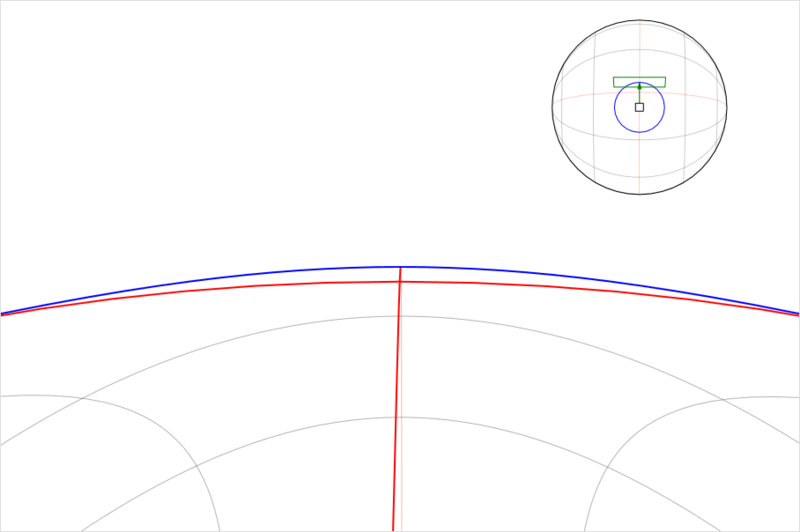 But as we get closer and closer to the surface of the Globe, this ellipses get distorted more and more by perspective. In the visible part inside the horizon, the grid circles in viewing direction look straighter and straighter while the curve over the horizon gets more and more pronounced (Figure 1). This matches exactly what we see on the images above. The curvature of the horizon as displayed in images is subject to the perspective distortion and is not part of a circle or an ellipse but rather part of a distorted circle. The horizon line appears stronger curved than the curvature of the earth as traced by a great circle (red horizontal line in Figure 2). 1- Over a flat floor we notice an apparent drop of a background object which the observer's eye level is lower than, as the tall object trends into the background. The object appears to drop and become smaller converging towards the observer's eye level. 2- If we were to then curve the flat floor surface we would still have the apparent drop + the actual curvature drop for a total viewed drop of the object (i.e. the man would appear to drop faster walking in the distance over a curved floor than he did over a flat floor). Agreed so far? 3- With your calculator can you determine the apparent drop of the man due to perspective over a flat floor? If so, can you also determine his drop due only to the curvature so we can add the values together for the total viewed drop? 4- If we were to use your calculator for a man 100 feet tall, observer, 10 feet tall and the man 200 meters away. How tall would the man appear to be relative to the observer's height? How much of the apparent drop of the man would be due to perspective alone? Pleas watch the video before commenting. LBB, you are confusing real sizes with sizes on an perspective projection of a scene onto a canvas. There is no drop in size in 3D reality due to perspective. Perspective does not change anything in reality. There is only apparent drop on the 2D image due to perspective. Therefore you can only measure this drop on an image. And the scene on the image depends on many parameters you can freely choose, like observer altitude, field of view, size of the image, distance to the scene. We can express apparent size as an angular size, which is independent of perspective. The angular size of an object does not depend on the method you use to measure the angle. Therefor all observers at your location will measure the same angular size of a distant object. Using all angular sizes of a scene you can map it onto an image and it will appear like in your vision. If we see that 1/2 of a distant object is hidden by an obstacle between object and observer, we can say the angular size of the visible part is half the angular size of the whole object, no matter how big the object really is. If we know the real size of the object, we can then say how much in meters is hidden or visible as measured at the location of the object. A curvature calculator, like eg. the metabunk curvature calculator, does not have perspective to take into account. The calculator uses the geometry of the real 3D distances, sizes and drops, not apparent sizes. Perspective does not change reality. 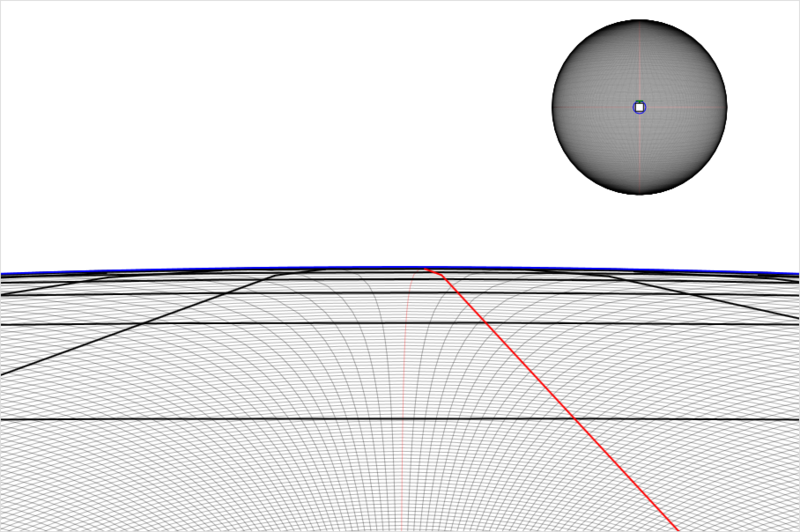 From the results of the calculations of the real values we can then compute how this values appear as angular sizes for an observer using the laws of perspective. Drawing the objects from their angular sizes gives a perspective representation of the 3D scene on a 2D canvas. Apparent sizes exist only on this canvas - hence the word apparent. So if for example the angular size of a distant object is 1° and the field of view of your camera in the current zoom setting is 2°, then the object would appear half the size of the image. If you zoom out to 4° field of view, the object appears 1/4 the size of the image. So apparent sizes and their relations make only sense on 2D images of reality. To finally adress your points: objects on a flat floor only appear to drop with increasing distance on a perspective image. There is no such drop in reality due to perspective. Perspective has no influence on the real scene whatsoever. The only drop in reality is from curvature. You can talk about an apparent drop due to perspective and compare it to the drop due to curvature only in your image. If you measure the drop due to perspective in your image and scale it up to the size of the object, you get a value that makes no sense in reality. It's a virtual value which depends on the 3D to 2D mapping. This value is different for each observer and has no counterpart in reality. LBB: With your calculator can you determine the apparent drop of the man due to perspective over a flat floor? If so, can you also determine his drop due only to the curvature so we can add the values together for the total viewed drop? Because my Advanced Earth Curvature Calculator implements a perspective representation of the computations for flat earth and globe, we can do this on the calculated image. The result depends on many observer specific parameters. You cannot derive a common statement from it which can be applied to reality. It's all an apparent thing individual for a certain observer. Perspective is a special kind of projection of a 3D world onto a 2D image. You can only measure drops and size changes due to perspective on this image. There is no such drop due to perspective in 3D reality.